Following on from my previous post on the importance of improving on value-creating process linkages, it’s worth looking at the lean design process in more detail. 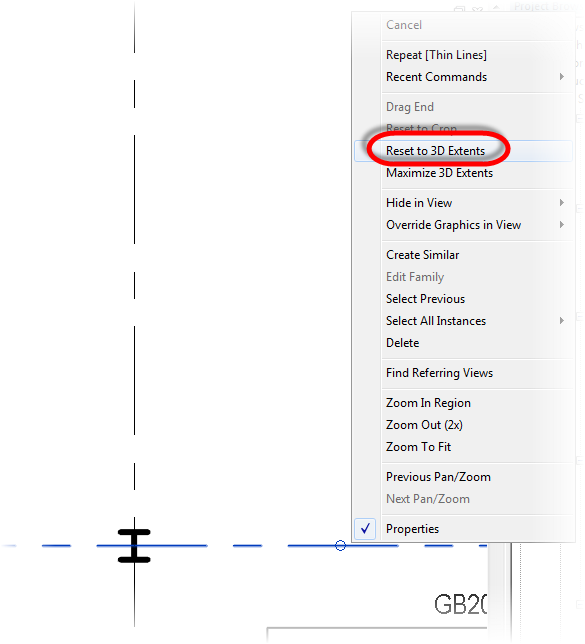 I want to give you three major practical principles for BIM to help in optimising the design process. To explain them, I’d like to highlight a different kind of model. It was developed in a package called ExtendSim, a software tool that allows you to simulate a range of processes. The authors of the paper, Application of Lean Principles to Design Processes in Construction Consultancy used this tool to map the building design process. Why this matters is that when applied to the design process of a major engineering consultancy in Egypt, the simulation showed that, by applying lean principles, the time required to deliver projects could be reduced by 7 per cent. The average staff utilisation increased from 0.4309 to 0.5116. That, my friends, represents serious money! The researchers identified three phases. 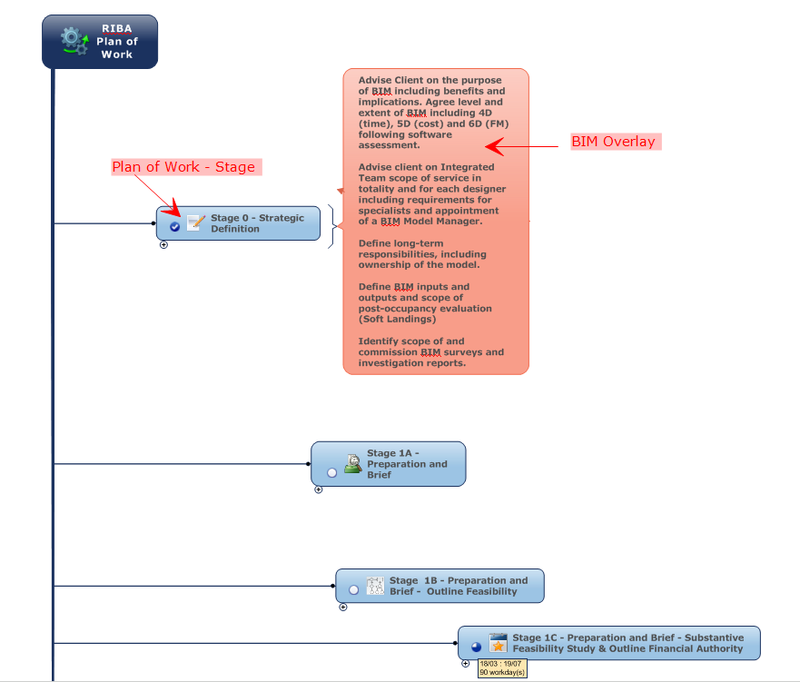 In the diagrams below, I’ve highlighted with a blue box those steps which create no value, but are unavoidable. 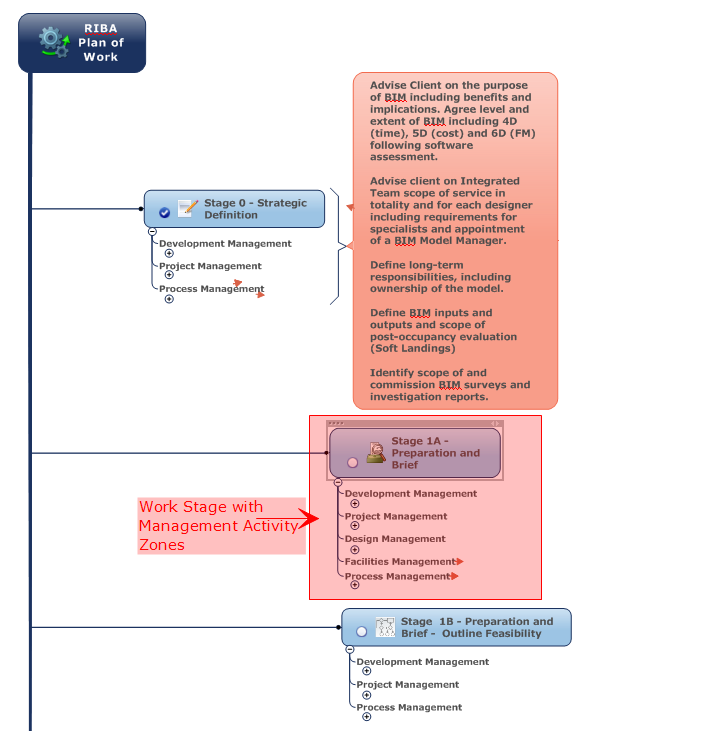 The red box indicates steps which create no value and are avoidable. 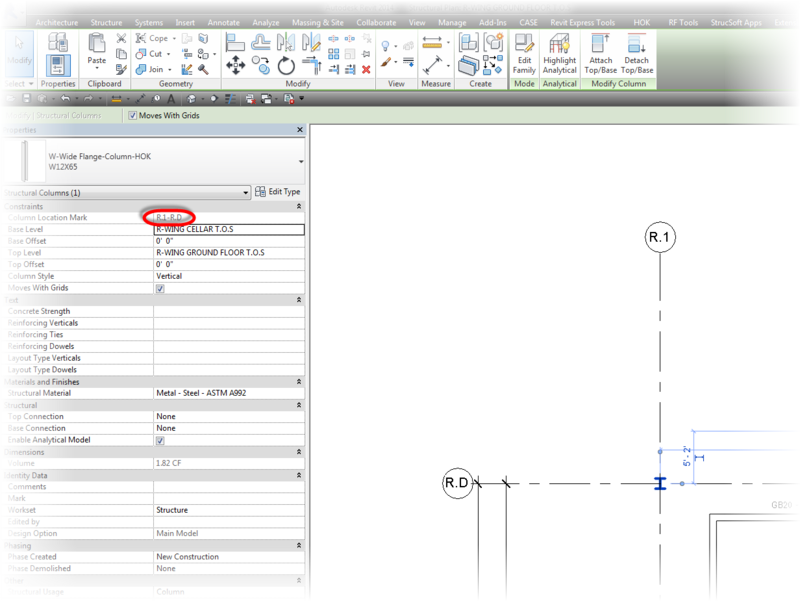 The Project Initiation Phase corresponds to the RIBA Plan of Work Stage 0 and 1 or the AIA Phases 1 and 2. As we at HOK know, workshops are critical to ensuring that the project gains client approval. Obviously, significant value is lost if a design is completely rejected, or returned to the Workshops stage. In the simulation, the architectural design was set to develop to 60 per cent before the structural and mechanical design effort was engaged. By way of contrast, Integrated Project Delivery (IPD) would involve earlier inter-disciplinary design effort. One of the benefits of an IPD contract is that it permits the HVAC and Structural Design integration to proceed long before the Architectural Design is 60 per cent complete. In all cases, what is important is the Batching block at the end of this phase. It’s about ensuring that all work-streams are combined to present a coherent design package, bringing together the contributions of each discipline. In lean thinking terms, what you are trying to avoid is unnecessary delay. The Finalisation and Closing phase looks like this. 1. Expedite Coordination by Inquiry in BIM. A key concept in Lean Thinking is Pull: no activity should produce a service until the next process downstream asks for it. Since documentation is downstream of coordination, views and sheets derived from the models of each discipline can be regularly reviewed in the BIM environment in order to instigate coordination inquiry. 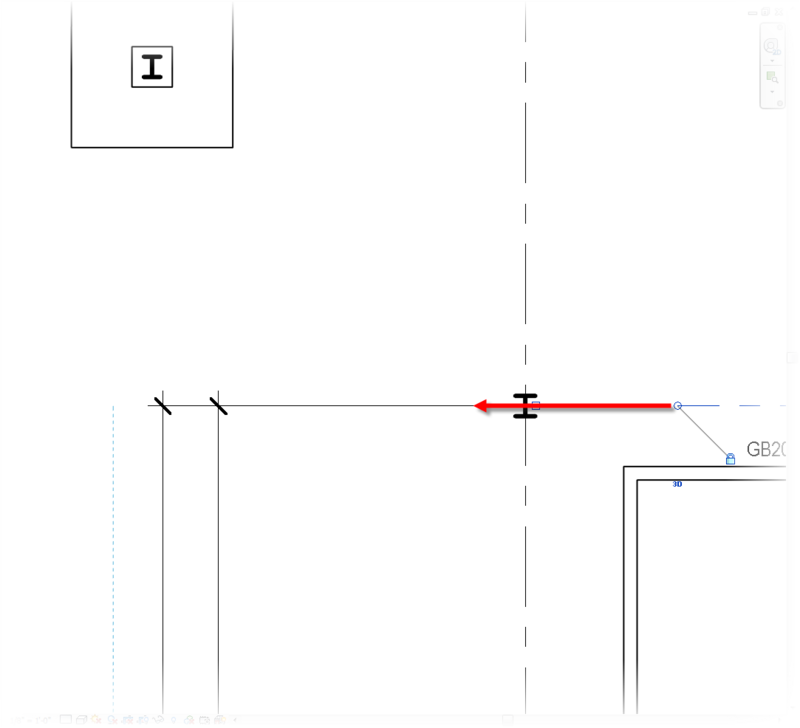 From early on in the project, we use Revit and Navisworks to identify design elements that are either absent, poorly defined, inconsistently presented, or uncoordinated with other elements and interfaces. It’s my job, so I keep asking until I get answers. Once you have answers, commit them to the model. On Barts and Royal London Hospitals, the BIM environment (at that time, Architectural Desktop) was used to capture design fixity. Design fixity is a consensus on a design issue that enables the project to progress. It is not ‘design freeze’, but it does provide an agreed basis for making and communicating decisions. It is attained by what’s known as “Last Responsible Moment” (LRM) decision-making. The LRM is that phase review decision-point beyond which the cost of delay outweighs the benefit of delay. While that moment is the Project Manager’s judgement call, the decision is informed by several factors, including the lead-time for the documentation phase. We can run all the client workshops that we want, but at that LRM, the design team must commit to a decision or begin to lose money. In order to disseminate design fixity as quickly as possible, the BIM Coordinator must ensure that the project team promptly propagate to all models any aspect of design fixity that affects them. As BIM experts, we need to drive this part of the process. The lack of immediate propagation of design fixity to the value chain is probably the most significant hindrance to adding value. The BIM Coordinator should set up the bulk of numbered sheets and implement consistent view templates in accordance with agreed drawing presentation standards long before the deadline looms. This will ensure that, once the design is complete and coordinated, production information is delivered as quickly as possible. The last-minute implementation of project-wide BIM standards and templates is to be avoided as it will invariably compromise the agreed delivery timescales. As HOK buildingSMART Managers and BIM Coordinators, we are fortunate to inherit great processes from the hard work of our senior buildingSMART staff. They make our work a lot easier. As we apply them, let’s just remember to prioritise these three key activities that can accelerate the addition of value to our projects. Towards the end of last year, I began to think more intensely about how we derive strategic value from BIM, not only as a means of improved perceptions, but also as a competitive advantage. In other words, how does information (the ‘I’ in BIM) enable a practice to outperform competitors? For the most part, I can often discern in strategic discussions about the value of BIM, a conflation of the terms, knowledge and information. Perhaps, this is aided and abetted by the ubiquitous mantras we find on social media: reminding us that knowledge is power. Well, the same can be said of electricity, but both are useless, if they remain unconnected. Instead of just knowledge, BIM provides us with a toolset for simulating and varying the complex interrelationship of factors that have significant potential to affect the human experience of a building. From cost to accessibility to environmental impact. Yet, that’s still not enough. An awareness of these factors and how they are expected to relate to each other (i.e. knowledge) must become information: it has to shape (literally, inform) our design ideas and collaborative decisions. For that to happen, BIM requires Senior Design team participation: challenging the model’s assumptions with added priorities and insight that only experience can provide. Porter goes on to emphasise that these linkages are both external and internal and that value is created when we optimise them. Think about that and look at your latest process diagram. According to Porter, the connecting lines and arrows are as important as the boxes because they represent value-adding linkages. However much we initially base our BIM process maps on the intended output, what is key is that we are open to create and improve those linkages as the project changes and advances; linkages that can enhance our overall value proposition. It also means that BIM must now become more a platform for opportunity, rather than for ensuring data compatibility. Just as a candy manufacturer might save processing steps by persuading its suppliers to deliver chocolate in liquid form, we must discover the optimal form in which and pace at which BIM data should pass through different departments in our own organisation and those of project stakeholders. What opportunities are we missing? Of course, what affects our capacity to effect a change in an organisation, project, or industry is relative bargaining power of the various stakeholders. Yet, the factors affecting the balance of power between them is not simple. A particular manufacturer may have significantly more influence over their supply chain than another. Equally, the aesthetic vision of a single fashion designer can hold sway over vast swathes of the billion dollar clothing industry. Influence is not just about monetary clout. It is about the ability to inspire others. It is because of this that we soon realise that while our professional bodies may influence broad agreement on data formats through protocols, it requires considerably more negotiation to develop a project consensus on the optimal form and frequency for sharing data with an extended team. Varying levels of experience and understanding in BIM across the industry make this especially true. The important thing to remember is that for a Building Information Model to become a competitive advantage, it should both lower cost and enhance differentiation. At the very least, if BIM does not do both, it should do one or the other. Otherwise, such valuable information can lose its competitive advantage. I've been looking for a tool to capture the complex task relationships and dependencies on our projects. This interest arose from a recognition of that, while resource management software like Deltek can produce great utilisation and billing reports, a more visual tool is needed to communicate the on-going status of project tasks. As a high-level template for identifying the key project stages, I referred to the RIBA Plan of Work, which is the definitive UK model for the building design and construction process. It is generic enough to be applicable to all project typologies. it's clear that other standards would be applicable elsewhere. 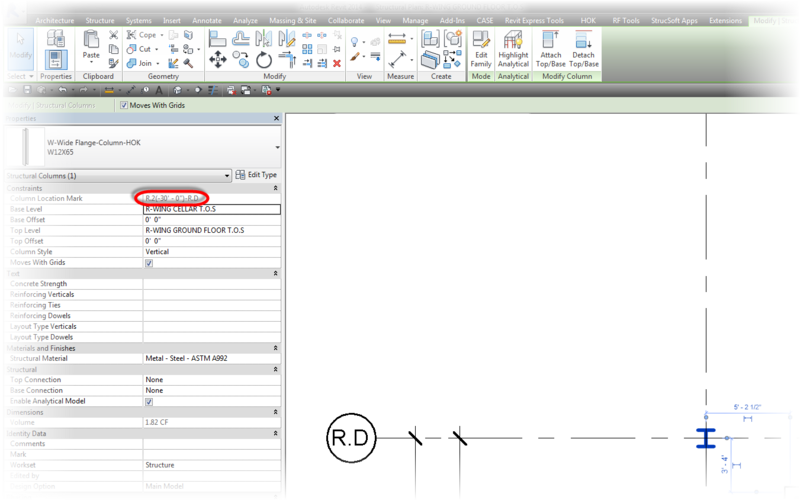 The BIM Overlay to the RIBA Plan of Work was issued in 2012. 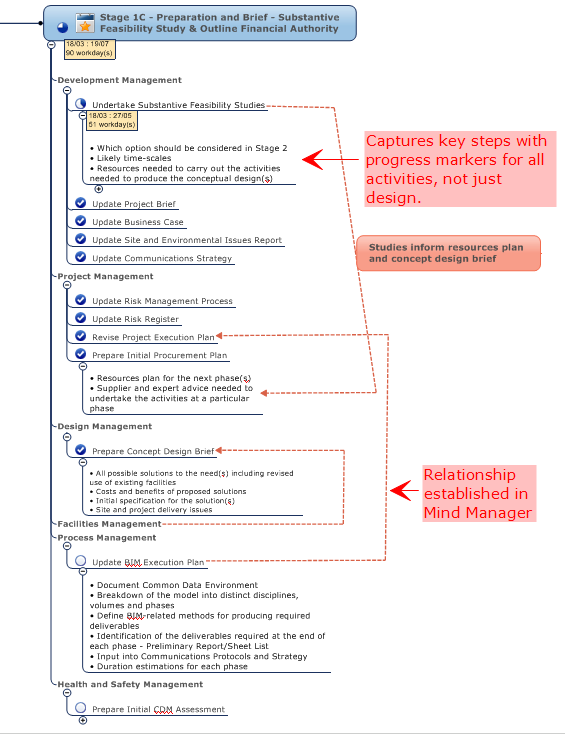 It sought to map core BIM activities onto the key stages within design and contructiion process. We can then apply an breakdown of the key processes within each zone. For this, we can apply the Process Protocol, a freely downloadable set of documentation developed by the University of Salford in the early 2000's. The processes defined therein are applicable to any project. 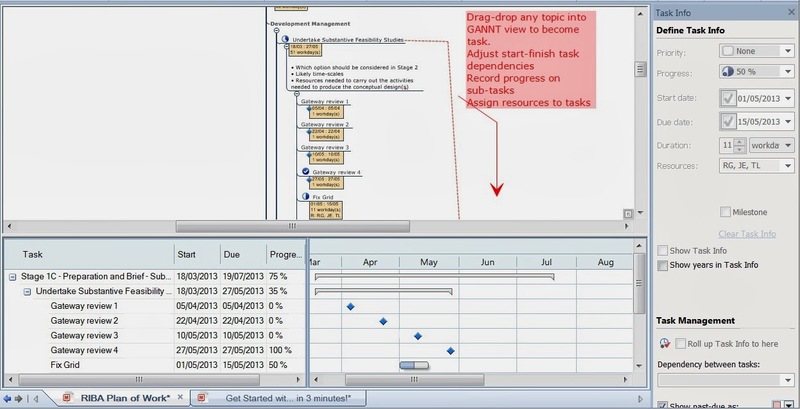 The GANNT feature of Mind Manager (View tab) facilitates the mapping of actual project processes, milestones and even resourcing into the Map. I used part of the LG Science Park project schedule to see how this would work. The result was very encouraging. Some would ask: 'What this this got to do with BIM?' I would answer that the integration and monitoring of tasks (including individual BIM tasks) is a key means of implementing process transparency and efficiency on our projects. Mind Manager is by no means the only game in town, but I'm keen to discover the value that we can derive from such a useful tool.